Dyna-Ski Boats normally have hydraulic steering. On many boats hydraulic steering is an expensive option. Hydraulic steering is often called "power steering" which it is not. 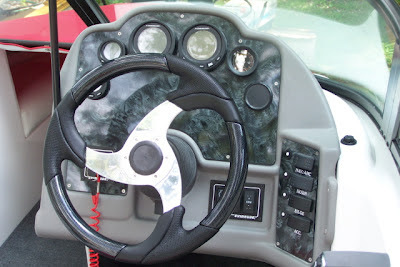 Hydraulic steering does make the boat with it on much easier to steer but there is no power assist like a vehicle has unless the hydraulic steering has the power assist option. Hydraulic steering makes it much easier to steer the boat that has hydraulic steering on it vs a boat that does not have hydraulic steering. The smaller the motor size the less the need for hydraulic steering. Bigger motors and faster boats should always have hydraulic steering. Hydraulic steering does not give much feedback to the driver so it should not cause the driver to change direction as a result of torque steer generated by the motor's prop turning. Some of the mechanical steering systems suffer from torque steer. Torque steer can be dangerous. 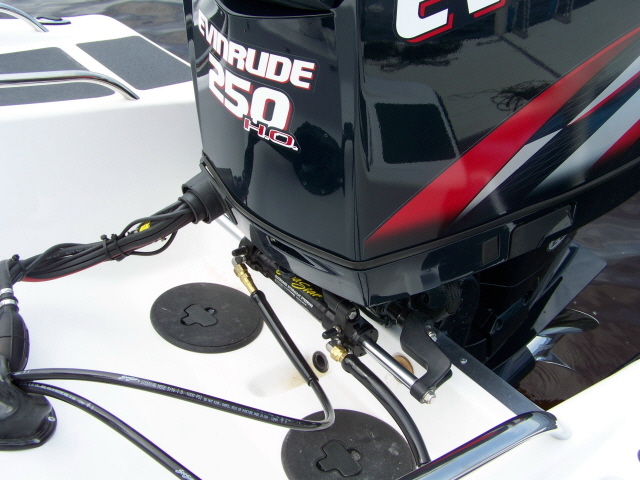 Dyna-Ski Boats with two motors usually have the same steering motor cylinder that single engine boats do plus a tie bar to connect the steering of the two motors. Three motored Dyna-Ski Boats should have two motor cylinders and two motor tie bars along with a higher capacity helm to move more fluid. Needless to say if one cylinder works with two motors it is very safe for a single motor.